Forty years after the concept of “bioethics” was introduced, it has emerged as the moral umpire in the fields of medicine, science, and technology. The bioethics of today is a broader enterprise than the familiar realm of medical ethics. Originally conversant with Christian moral reflection, bioethics has emigrated from bedside consultations to interdisciplinary research, public policy debates, and wider cultural and social conversations that all privilege secular discourse. The Scandal of Bioethics glances backward to ask questions about the legacy of Christian thought in bioethics, while facing the future, the purpose, and the place of Christian thought in bioethics. The time has come to address the tough questions: Has ‘Christian bioethics’ made any difference? Will Christians lead with moral courage and imagination? Is there a future for right of conscience in medicine and research? This conference will also address related trends in women’s health and reproductive ethics, the growing role of empirical research, global health, and a vision of biotechnology that affirms both human dignity and human flourishing. 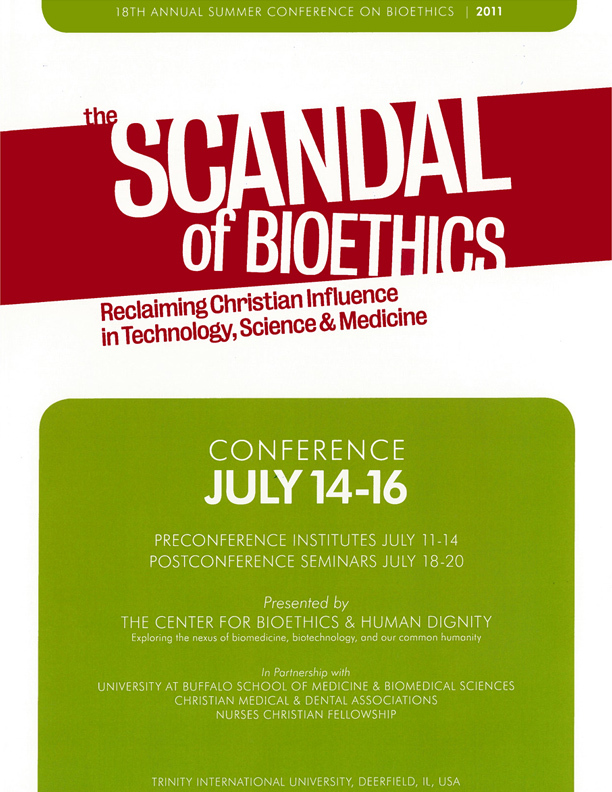 Colloquium: Can Bioethics Be Christian?